Yes, I already have plenty of bicycles. But like a lot of people that go "bike crazy", I have this list in the back of my head of bicycles I would grab if the opportunity arises. While getting a nice new bike, whether production or custom, would be cool at some point, I don't have that kind of cash. So I'm usually thinking more along the lines of vintage, especially since there is so much out there. There are several bikes on that list that intrigue me but what's possibly at the top of the list (besides a Raleigh Portage or Tamarack*) would be the Bridgestone XO series. For those of you not in the know, Bridgestone is a Japanese company mostly known for car tires, but they were/are a bicycle manufacturer too. (It's hard for us Americans to wrap our heads around this multi-disciplinary manufacturing concept, but Panasonic went even further: manufacturing electronics like TVs and stereos alongside bicycles and bicycle tires.) And Bridgestone USA was headed from the 1984 to 1994 by none other than King Of All Retro-Grouches, Grant Petersen. Grant is best known nowadays as the majordomo of Rivendell, but Bridgestone was where he "cut his teeth" in the bike world, so to speak, and became known to the bicycle nerd public. Being the "head" of the American wing of a Japanese company was a weird thing, and weirder for someone with the individualistic and idiosyncratic tendencies of Petersen. From the accounts that I've read, there was a constant tug-of-war between Grant in the Bay Area and the Bridgestone heads in Tokyo who would rather have a more "typical" bike company. Sure, Bridgestone USA offered the more "typical" bikes of the time period, meaning road bikes and mountain bikes, with a few token city/utility bikes thrown in. These bikes were all very good. But the XO series, only offered from 1992 through 1994, was possibly the best, and definitely the most individualistic of the bunch, and that was all due to Grant. The XO series could loosely be defined as a "hybrid" bike. Before the term "hybrid bike" took on all the connotations of a mediocre bike that does nothing well (just one step above the more dreaded "comfort" bike), hybrids of the late 80's into early 90's were more interesting machines, and while never top of the line bikes, they were capable bikes. Bridgestone/Grant took this idea further and really tried to synthesize a bike crossed between mountain and road. The XO series was the answer. As Sheldon Brown states, "They were intended as fast, sporty urban street machines, primarily for pavement use, but more rugged than traditional 'road' bikes. Most of them featured 'moustache' handlebars and slick medium-width tires." The top of the line was the XO-1, produced only in 1992 and 3 and in limited numbers. It basically took a nice road frame and put 26" wheels with clearance for wide tires. This doesn't sound that unusual today (think: Long Haul Trucker) but twenty years ago the concept was downright radical. 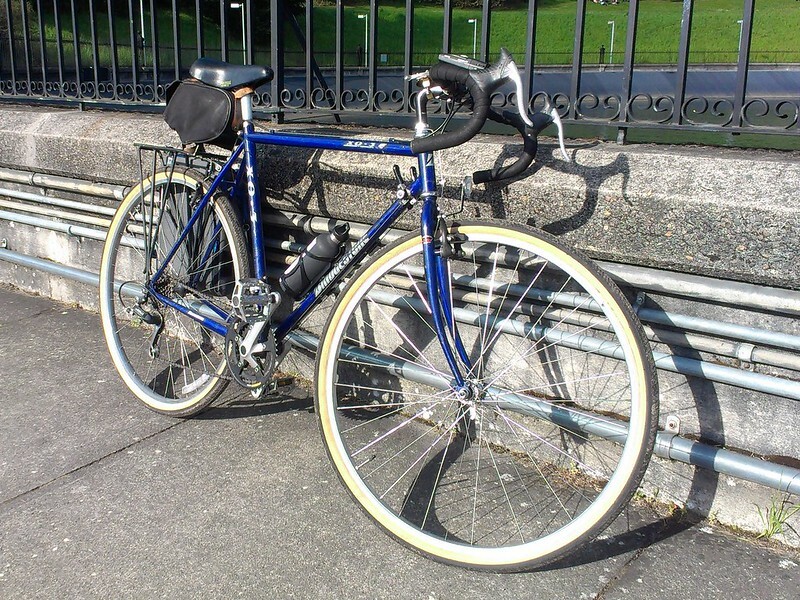 The XO series could be considered the genesis behind the "all rounder" idea of bicycles, where a bike can be equally at home on pavement and dirt, an notion that Petersen carried with with him (and refined extensively) when he founded Rivendell in 1994. 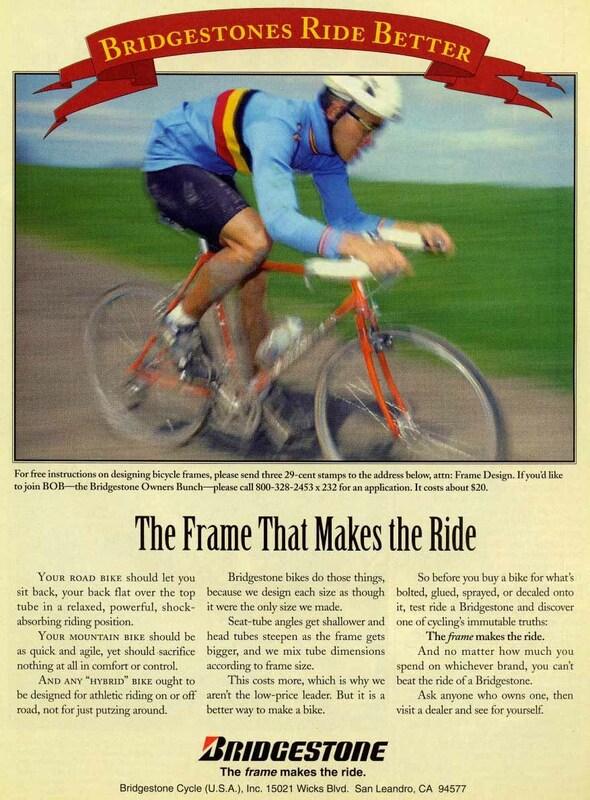 It was also the "make or break" for Bridgestone USA, a company that not only was derided in the bicycle press of the time (Bicycling magazine, for one), but was not making a profit. If it worked, it would prove all of Petersen's theories right. Unfortunately, it didn't take off. Tired of not making any money and the crappy dollar-yen exchange rate, Bridgestone shuttered US operations in 1994, leaving Grant free to pursue his own bicycle dreams. The XO line of bicycles is quite covetable today, especially the XO-1. Covetability means "expensive and rare", so the chances of an affordable XO-1 popping up are slim. There were other, lesser models available though. I've seen a few of them pop up on the local Craigslist but they were all on the small side. So when I saw an XO-3 pop up in my size, I got interested. The XO-3 was also an interesting beast. It was offered from 1992-4. The 1992 version was the lowest of the XO series for that year, and unlike the XO-1 and 2, it had 700C wheels and a TIG welded frame with unicrown fork. (It also featured cantilever brakes.) The 1993 and 1994 models used the same lugged frame and 26" wheels as the XO-1 but had lesser componentry. (When the XO-1 and 2 were not offered in 1994, the XO-3 became the top of the line of the series, and there were other lesser models beneath it.) When this particular XO-3 popped up, it indicated 700C wheels which meant 1992 vintage. I was more interested in a 26" machine, so I didn't jump the first time. The ad went away but then came back a couple days later. By this time I realized that I might not get the opportunity for any XO series bike in my size again for quite some time, regardless of preferred wheel size, and the price of this XO-3 was quite reasonable (they wanted $220). 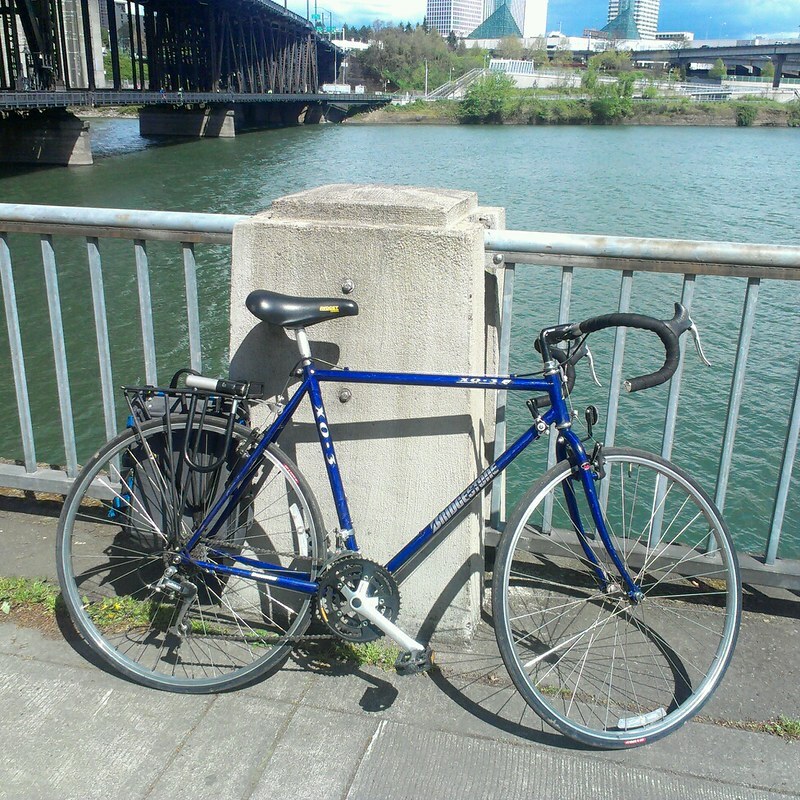 So on Monday I spent an hour and a half on transit to get to the westside suburb of Beaverton, tried out the bike, liked it, talked the seller down to $180, and off I went! A couple hours after purchase. The bike itself is in decent condition. Yep, there are scratches on the frame, but to be expected for a 20 year old bike. The paint is that weird shade that is neither blue nor purple that was popular in the 90's. (It's interesting that they chose that color since Grant made a big deal about not using day-glo paint schemes and the like because those colors would look dated. While this "indigo" color definitely dates the bike, it is by no means a bad color.) The componentry is in okay shape, mid-level unexciting Shimano. The rear rim is a bit concave meaning the wheel may need to replaced at some point, and the drivetrain will no doubt wear out. But I'll worry about that stuff later. The most interesting aspect of the bike is the handlebars, levers, and shifters. The original XO-3 came with an arced bar with mountain style levers and top-mounted shifters. Someone at some point converted this bike to drop bars with aero road levers and downtube shifters. But how does she ride, you ask? Great! It's a fun bike that fits well. It feels pretty light and zippy, which is interesting since this bike isn't particularly a lightweight machine (just shy of 30 pounds). But it sure feels more nimble than anything I currently own. And that's the way I intend to keep it. I wanted to have something a bit lighter and a bit more "road" than what I currently own. 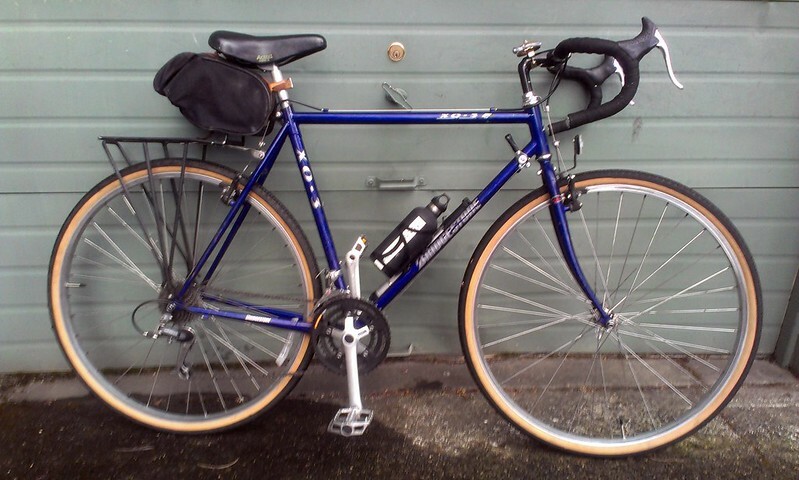 It's ironic that my most "roadie" bike is a early 90's hybrid, but that's because I'm weird like that. But it's also a testament to Grant Petersen's design philosophy. I also swapped out the vinyl Avocet Touring saddle with a leather Avocet Touring II which came off the Crested Butte. While the two saddles are similar looking, I much prefer the leather one (it also has bag loops) and the couple basic Touring models I've had have the vinyl separating from the saddle body. Swapped out the chintzy generic pedals with some alloy "BMX" grippy pedals, may throw on a different set at some point. Threw on the Minnehaha small saddlebag, which seems to be the bag I throw on all my bikes before I decide on a different one. Added bottle cage with pump mount. There will be more stuff to come. I still need fenders. And I will most likely change out the drop bars for mustache bars. The drops don't feel right aesthetically and physically, and while the '92 XO-3 didn't come with mustache bars, it feels more "right". But that will probably be the end of the major stuff until things wear out. I've only had the bike for two days and have had a bit of fun with it. 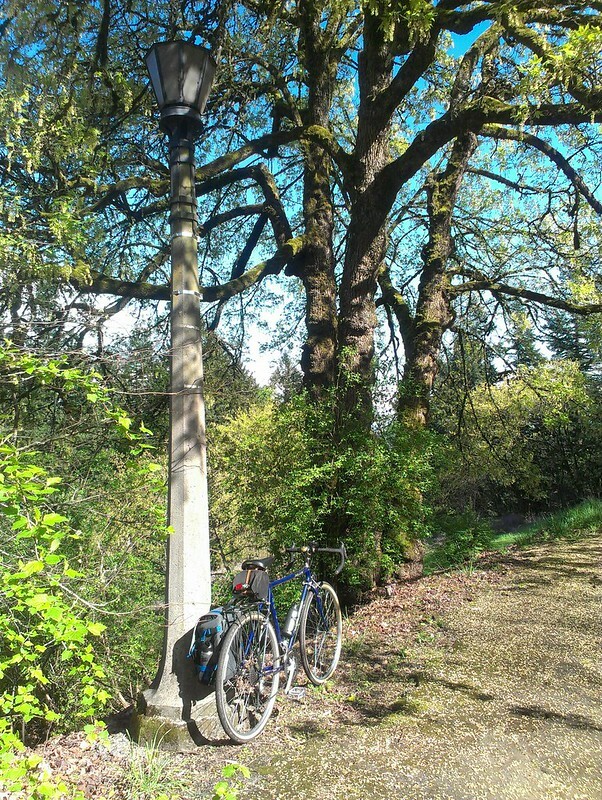 It was nice out on Tuesday so after work I headed up to where else but Mount Tabor, a good and convenient proving ground for all my bikes. The gearing, while not as low as either the Long Haul Trucker or Crested Butte (50-40-30 triple with 12-28 seven speed cassette) got me up the hill (grades up to 10%) just fine. The medium-width tires did well on the dirt paths. 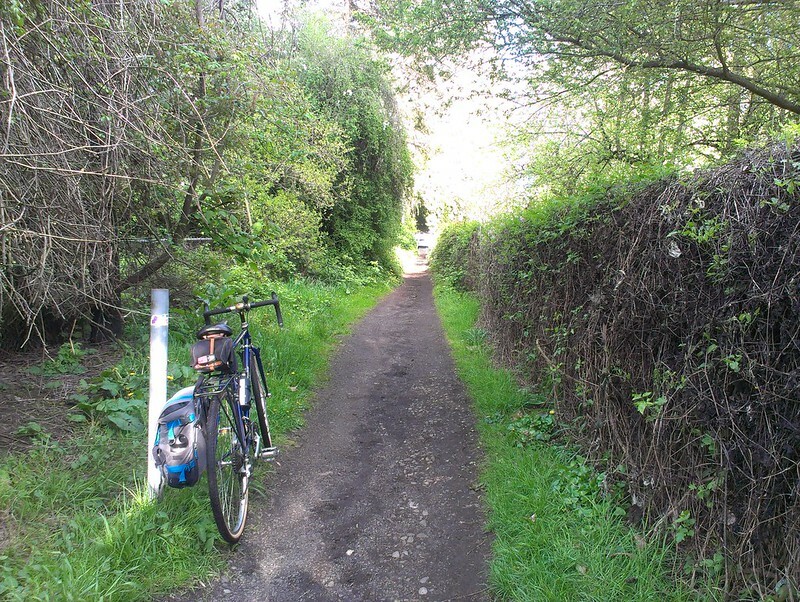 The brakes worked on the descent (though the front was a bit squeaky, par for the course with cantis). While the pannier on the rear Blackburn rack affected handling a little, I didn't have issues with heel strike (the XO-3 has relatively short chainstays.) In short, it did everything it needed to do, and then some. And it being a Bridgestone, it's been getting some looks. I took it by the local bike shop** and of course it got compliments, plus the "I had an XO-3 at one point." As stated by one mechanic, the XO-3 was not a fancy or a flashy bike, but a solid, good bike. *Oh yeah, and a Raleigh Tourist DL-1. **"Local bike shop" in Portland? Ha! There's about as many bike shops in this town as there are coffee shops. Very nice! You got one of your dream bikes. Gumwall tires are very appropriate on this bike. I vote for mustache bars. You can get a basic lightweight pair for around 25.00 from aebike.com. Awesome score,my friend! She looks good,mustache bars will really set it off IMO. Nice bit of Bridgestone history I didin't know too,loving the write up,but loving the bike even more! Congrats on your new ride! You've already done some nice mods to it, and I'm sure you'll have it in prime condition soon. I agree that the fatter skinwalls look great. I joined the Bridgestone club/cult in 1990 with the purchase of a new MB-1, just as lugs, steel, and rigid were becoming anachronistic terms. It was my first top-quality bike, and I still own it, but haven't ridden it in years. I'll have to do a post about it at some point, and actually ride it, too. In about '94 I could've bought a new '92 XO-1 from my local shop for half price, because no one wanted it. I seriously thought about it, but couldn't swing the cash at the time. Oh well. It's amazing how the aura of Bridgestone persists after all these years; if anything, it's stronger now than in the old days. I have an original Nitto mustache bar that is yours if you want it. I had it on my Cross-Check for a couple of months several years ago, but it never really meshed with the bike. Andy, I bet you are now kicking yourself over not buying that '92 XO-1! But hindsight is 20/20. Yes, there is some regret, but it's not the only bike that retrospectively should not have slipped through my fingers. Such is life. Email is sent; package soon to be. Happy to contribute to you project. I echo the same sentiments as above. Great score! An XO-1, 2 or 3 is on my list for the stable but they continue to be coveted, elusive and most times, expensive. This especially holds true for the XO-1, which many consider a grail bike and even models that need significant work selling for a premium on eBay. I look forward to seeing how your new XO-3 evolves and how diverse it proves to be on the different cycling surfaces you try out. Yes! Please send a picture!